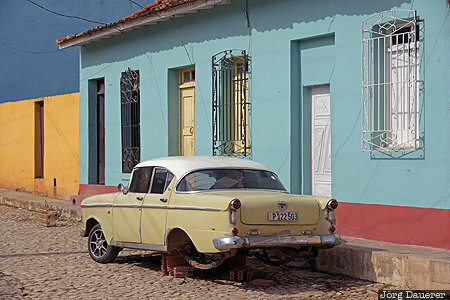 The wreck of a classic car in front of the typical decaying colorful facades of Trinidad. Trinidad is in the province Sancti Spíritus in the south of the Caribbean island of Cuba. This photo was taken in the afternoon of a sunny day in March of 2016. This photo is part of the exhibition Car Wrecks (October 2017). This photo was taken with a digital camera.